Dayliner is celebrating their third album, III, with an indie-rock extravaganza at Union Street Cafe in Berwick this Saturday, April 6, 8pm ’til midnight. Tickets are $10 at the door. To add to the excitement, they’ll be joined by a couple of hot Halifax bands. First, some great alternative pop rock from Kids Losing Sleep, winners of “Best New Band” in the 2018 edition of The Coast’s “Best of Halifax” readers poll. 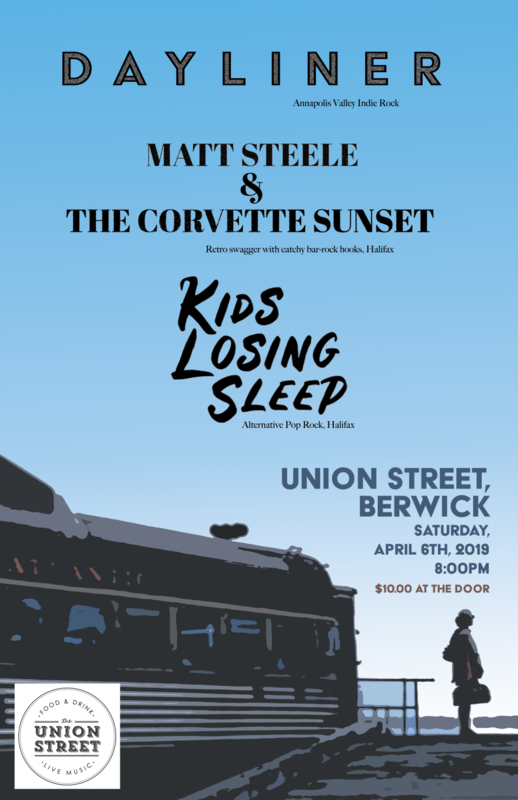 Then Matt Steele & The Corvette Sunset, with a blend of the hook-laden, soul-searching songwriting of Tom Petty, and the frantic, frazzled, up-tempo power-pop of Elvis Costello. Kim Barlow (KB): Why do you call yourselves ”the Valley’s most passive-aggressive indie rock band”? Dayliner (DL): We try really hard not to care about “making it” but underneath it all, we are just a bunch of insecure guys trying to get attention. Plus our answers to your questions will probably reinforce the moniker. KB: Caleb Miles is an amazing guitarist, how did he end up being your drummer? KB: Who writes the songs? What is the inspiration/theme for the new album? DL: Derick tends to come up with a foggy idea, which we bicker and argue over until we have what we think is a song structure, and then Derick makes vocal sounds that he calls “lyrics.” Sometimes Mark brings in the original foggy idea. Nothing is considered finished until Caleb is done throwing things, or until Jai stops rolling his eyes and sighing. From the production side, the underlying premise of the III album was to record the new songs as live as possible after having played them for almost a year, as opposed to recording them first and doing a bunch of overdubs that couldn’t be reproduced on stage. We also wanted a louder, more driving album. The last one was kinda moody and spacey. KB: How or why did you team up with the other bands on the line-up? Have you done shows with them before? DL: This will be the first time for us to play with them, but we’re fans. When you think about it, inviting bands to your hometown saves you the drive, right? It’s kind of like a cultural exchange. KB: What’s your band’s background? DL: Everyone comes from somewhere else, we all chose to trade city life for houses in the woods to raise kids, live simpler lives, and escape the pressures of urban life. Jai and Caleb seem to have the most past-band “experience,” and are probably also the two members most surprised that the band has stuck together for as long as it has (having had the most past-band “experience”). Our Clark Kent disguises are physics/art teacher, librarian-in-training, computer programmer, and housewife. Whoever guesses all four correctly wins a Dayliner t-shirt!